Do your pets have rituals they perform on a regular basis? Faraday does! Now that is how a kitteh gives a mommy a proper Welcome Home! 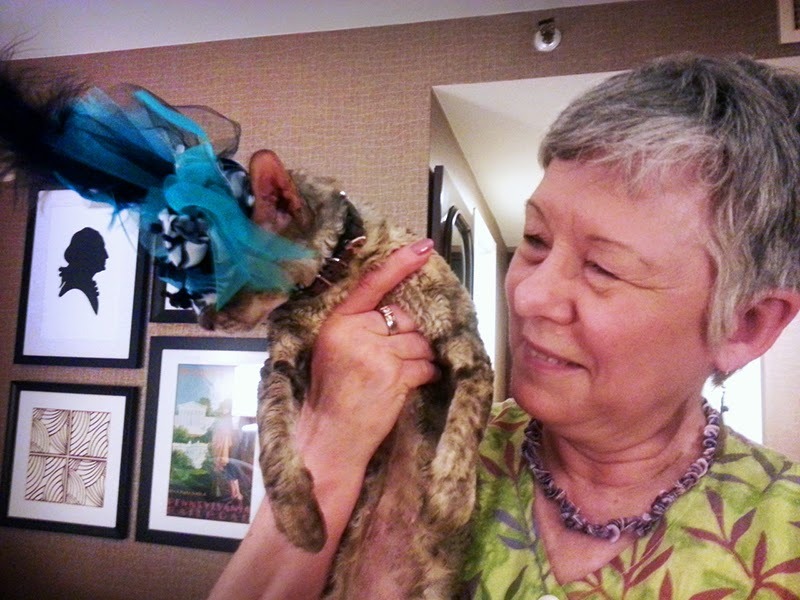 As you've probably guessed, she was at BlogPaws last weekend. She traveled there with Amy from Sebastian the Sensitive Soul. Amy got a lot of Odilia Time at the event. 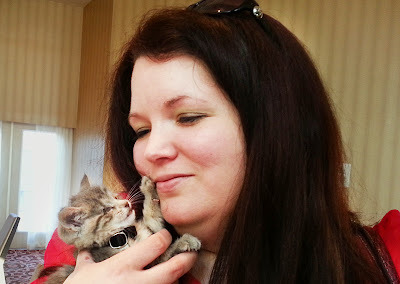 They had a marvelous time meeting up with so many pet bloggers, like Connie from Tales of the Foster Kittens and Sparkle the Cat's human, to name a few. They also had a chance to spend some time with Teri from Curlz & Swirlz and the famous Disco NoFurNo, Brighton and the trés glam Coco. Teri made us kittehs a special swag bag full of all sorts of fab treats. It was by far the best stuff our mom brought back for us and we looooved it, can you tell? 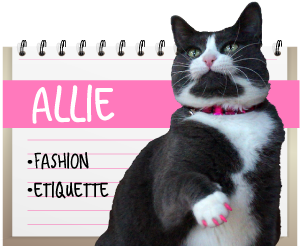 This is Teri, with her fashionista, Coco (Allie thinks her wardrobe is simply divine, if a bit shy in the PINK category). 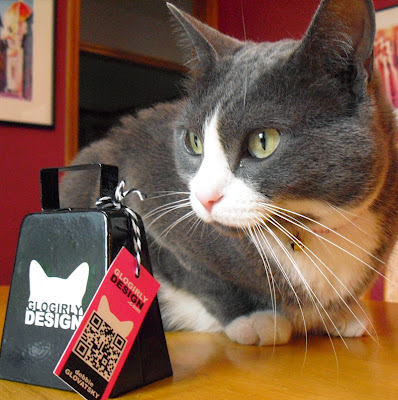 Then she told us about the infamous Cat Bells that Glogirly brought for all the cat bloggers. We hear they used them - loud and long and often - during the awards ceremony. Each time a cat blog was mentioned, of course. But wait - does she simply approve because Katie's her homegirl, and - well - the tag is PINK? Inquiring kitties sought out an impartial opinion. Someone who doesn't think much of cat bells one way or the other, since he can't hear them anyway. 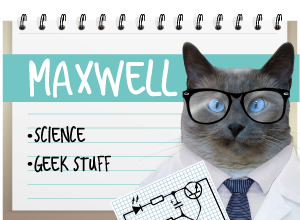 What say, Maxwell? So. Cute videos of kitties doing cute things, plus loads of gratuitous kitten and cat shots. We're calling it good and hitting the "publish" button on this one! Great videos, great pictures, great post!!! Well those were some great videos. You kitties sure have such a good time. Glad you got all those terrific toys at Blog paws from Teri. Have a super week end. What a perfectly PAWSOME shout-out! Thank you! aaaand we just got internet back, so the link's now working too! WOOT! The bell is so cool. So glad mum had a great time. Have a super Saturday. pee ess: Daddy scatters millet seed for our birdies. Cardinals and jays like sunflower, and finches like thistle (niger) seed. OOOOoooo we loved the videos and thanks for sharing all of those pictures from BP! We loved Teri's swag bag too! And yes, there were smacky paws at our house also. The mom hasn't let us play with the Glogirly bell yet. What's she waiting for???? Super videos.....and obviously three very happy cats when it comes to the swag bag!! that first video is completely priceless! The complete bliss-filled expression says it all! "Welcome Home Mom"
All the videos are great The first one with Faraday getting all the loving really makes us miss our mommy. We sure hope she comes home soon. Our angel Steamer used to leap onto mommy's back like that. She loved cereal so mom would have to stand in the middle of the kitchen to eat it. Steamer would leap off the counter and grab onto mom's back with her claws. OUCH! Purrs and hugs from the kitties at The Cat on My Head, Lily Olivia, Mauricio, Misty May, Giulietta, Fiona, Astrid, Lisbeth and Calista Josette. What a great post! Mes LOVED watching the cat videos and mes tried to plays with the sparkly pink ball! Me thought me had it! Mes always ignores Mommy when she comes home from away. 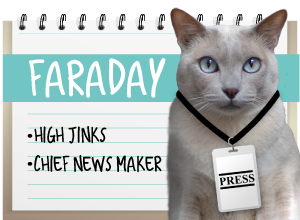 Purrhaps me should try a spectacular welcome like Faraday. Whee what a great time was had! Thanks so much for sharing the goodies with us. Three adorable videos, we really loved them all! That cat gymnastics is something else! That dismount looked like so much fun - could I have a go??! We are sooo glad you really enjoyed our purresent! Those tinsel balls are our favorites, too! it was very nice seeing your catma at BlogPaws, too!